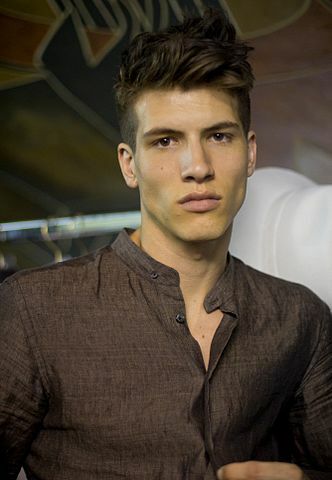 Adrian Cardoso was born in Cancun, Mexico, on November 19, 1991, is an Spanish male model. Cardoso began his modeling career in 2008, he won competition for aspiring Aruba Model Search models. He made his runway debut for Givenchy at Paris Fashion Week (2010). Adrian's hobbies are Thai boxing, Football and kitesurfing. He dated supermodel Lais Ribeiro (2012-2013). L'Officiel Hommes Italia, Esquire Serbia, GQ Spain, Hercules, Adon, Bullett, El Pais Icon Spain, Essential Homme, GQ China, METAL Magazine, Spanish V Magazine, S Moda for El Pais, Robb Report, Details, Antidote, Carbon Copy, Vogue Hommes Japan, Contributing Editor, City Magazine. Elisabetta Franchi, Just Cavalli, DKNY, BCBG Max Azria. Walked runway for Ports 1961, Corneliani, Timo Weiland, Parke & Ronen, Givenchy, John Galliano, Louis Vuitton, Mugler, Roberto Cavalli, Band of Outsiders, Tommy Hilfiger, Bottega Veneta, Dolce & Gabbana, amfAR. Represented by agencies Wilhelmina New York, Next London, Elite Milan, Barcelona Sight Management Studio, Paris Success Models. I look up to great athletes, such as the Spanish world champion soccer team, Paul Gasol in the NBA, Rafa Nadal in tennis, Fernando Alonso in Formula 1. New York, it has become my second home. I have great friends in and out of the fashion industry that live there, and the city is truly amazing to live in everyday of the year.